Close to the perfect lip moisturizer! by arewehavingfun? The design of the container isn't the most ideal, but this lip balm is just so cute. Not only is it adorable, but it's just such high quality. This is, hands down, my favorite lip balm. It makes my lips feel nice and smooth, rather than waxy and gross like some lip balms do. Try this, you really won't regret it! It's hard for me to find a lip balm that I like. You see, I find that most lip balms taste and feel just terrible on my lips. 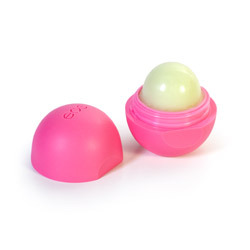 One day, however, I met EOS Organic Lip Balm; I fell in love at first try. The kind that I tried then was the Lemon, which I admit I do like more than the Strawberry Sorbet. Still, the Strawberry Sorbet is pretty amazing. I'm really excited that Eden has decided to carry the EOS line. I am writing this review based on the Strawberry Sorbet, as it has been so long since I have used the Lemon. So, what exactly is this, you ask? It's quite simple; this is a lip balm. It's meant to be applied to your lip, in order to provide moisture. It's great at preventing dry, chapped lips, so I like to use it multiple times a day. I don't think is going to do much for lips that are already heavily chapped, but it does do an excellent job at preventing chapped lips. So, all in all, I'd say this is a great product for anyone who wants to prevent dry lips. It's a great choice for individuals who strive to use natural products. This lip balm happens to be 100% natural, and 95% organic. In fact, the package states that this is certified organic by Oregon Tilth. Also, this product is made in the USA, which is pretty cool. The ingredients of this product are great; none of them alarm me at all. I find that most lip balms end up making my lips feel sticky, but that's not the case with this one. This lip balm goes on smoothly, and it makes my lips feel nice and soft. It also feels very light, almost like wearing nothing at all (but better!). I also have an easier time applying this lip balm than I have with other balms. The lip balm is just very soft, and it glides easily over my lips. The more you use it, the softer the actual lip balm seems to feel, and the easier it glides. That being said, the actual design of the lip balm may annoy some individuals. This is because the design is quite different than most other lip balms; it's not a stick, it's a little ball in a container. As for lasting power? This really does last. I do reapply it throughout the day, but I find that I need to apply it less than I do other lip balms. Also, the color of this lip balm is clear, so you don't need to worry about it adding any color to your lips. I've used this lip balm in both Strawberry Sorbet and Lemon. It's been a rather long time since I used the Lemon, but I do remember that it had a wonderful scent and taste to it. That being said, I can't really describe it exactly as it has been so long. As for the strawberry sorbet? It's truly an awesome flavor, though I do prefer the Lemon. The scent of the Strawberry Sorbet is not overpowering at all. In fact, I can't smell the scent at all, unless I place the container right under my nose. Even with it being close to my nose, the scent is very light and airy. Taste wise, it's very sweet, and the taste is long lasting. What's wonderful about the taste is that while the taste will slowly fade, it never leaves you with an unpleasant after taste. The design of this lip balm is really cute, but it's not the most functional. You see, the ball style makes this difficult to apply to just one lip at a time. For me, this isn't a huge deal, but it might bother others. Overtime I find that the application gets much easier, though it's not as easy to apply as stick lip balm. Despite the fact that the actual design isn't the best, I still really love this lip balm. I use it several times a day, and I always have it in my bag. While I use this several times a day, I probably don't need to apply it as frequently as I do. I apply it so often because I enjoy the taste, not because my lips feel dry. This lip balm just lasts a very long time, and it does just what it's supposed to do. I want to note here that I purchased this lip balm at a drug store. The packaging for the drug store EOS lip balm may be different than the packaging for the EOS lip balm sold here, despite the fact that it's the exact same product. The packaging for this is a little cardboard bit, with a little plastic see-through bit. The EOS lip balm is held to the cardboard by the plastic. Opening the package is incredibly easy -- just pull the plastic and cardboard apart, and you're set. The packaging offers minimal information, but what kind of information do you need for lip balm really? It states what it's made out of, and that it's 100% natural and 95% organic. It also provides the following directions: "Twist off cap. Pucker up. Smooth on. Smile" -- basic, but that's really all the direction you need for a lip balm. The actual lip balm container is sort of like an egg shape, with a flat bottom. There is also a small flat indent on the side of the container, which seems to make it easier to open. The top and bottom of the container feature the EOS logo. For the Strawberry Sorbet, the container is pink. To open the container, you simply twist of the top. I love the appearance of the container, but it does make it difficult for me to just stuff the container in my pocket. Not a big deal, as I carry a purse anyway, but if you prefer to stick your lip balm in your pocket? The shape of it is something to keep in mind. As for it being discreet? It's a lip balm, so there's no real need to worry about that. The packaging isn't obscene at all. I mean, it's suitable to be sold at Target, Wal Mart, and drug stores, so...how bad could the packaging be? I LOVE this lip balm. I have tried this in many flavors, and I have yet to find one that I dislike. This is the only lip balm that I ever seem to use the entire container of, which says a lot. It's amazing, and I definitely need to stock up on it. I love this too! Nice review, thanks! Nice review! I've really been wanting to try these! I am glad you like this one. This is one of three that I like. Thanks for sharing! Best EOS organic lipbalm flavour? What flavor lip balm should I get? Thank you for viewing Organic lip balm review page!